Scripture memorization is an important part of spiritual growth. Bible memory is a great tool for the Christian who understands the importance of the Word of God and wants it available in his mind for meditation and application. The Bible club leader is an important link in a child’s appreciation and understanding of the significant role the Bible can play in his life. One of the best aspects of Scripture memorization that takes it out of the realm of drudgery and into the area of personal excitement is the understanding of what one is learning or has learned. This is where you, the Bible club leader, come into the picture. Be sure the children of your group can say the verse or passage not only as it’s found in the Bible, but can say it in their own words, too. This will help you determine if they really know the meaning of what they’ve memorized. Ask parents to say the Bible memory verse with their young child before bed each night, even if the child doesn’t join in. The verses will be sinking into the child’s heart and mind even if he’s not participating. After several weeks (or months, depending on the child), parents may be surprised to find their child saying Bible verses along with them, without any prompting. During Honeybees or Cubby Bears, encourage each child to say the memory verse to a leader before they go to the snack table. Even if the child says nothing, the leader can say the verse, encouraging the child to participate. When he’s ready, the child will join in. Weekly memory verse sessions will help prepare the child to say the verse at the end of the month before receiving his award. When giving awards to Cubby Bears and Honeybees for saying their memory verses, make sure every child receives an award, even if he only says one or two words of the verse. Children may say the verse along with a leader instead of by themselves, if they prefer. However, if the children begin the memory verse program when they are two or three, most will be able to say the verses by themselves when they are four and five. Each verse is memorized over a four- or five-week period, ensuring that every child who attends regularly will be able to say the verse at the end of the month. Most children are good at memorizing, even though they may not want to admit it. Primaries have the same Bible verse to memorize (except the verse in the Stand-Alone Meeting) for two weeks in a row. To help children memorize the Bible memory verse, encourage parents to say it with their child each day during the week. After a few days, have the whole family say it together. Inform parents which Bible version — King James Version (KJV) or New International Version (NIV) — you are using for memorization. 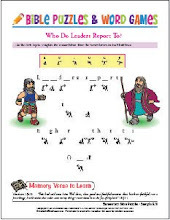 The verses for each quarter are listed on the Take-Home Papers and Classroom Activity Sheets the children bring home each week. Talk about what the Bible memory verse means during the Bible club lesson. Let the children explain the meaning to you in their own words. Have each child try to say the verse from memory, with a friend’s prompting, before saying the verse for the leader. Bible verses will be more fun to learn and easier to remember if movements are put to them. Putting rhythm to words and making the verse into a chant will also help, if this is suitable for the words being spoken. For example: “This is the day which the LORD hath made, we will rejoice and be glad in it” (Psalm 118:24). Say (with the children seated), Stand up on every other word while we say the verse together. Then have them jump a small jump while saying every other word in the verse. Finally, have them jump high with both arms raised while saying every other word in the verse. Try it — it’s fun! Music is also a wonderful aid to memorization. Let your students make up a tune to go with the memory verse (and include the reference in the song, if possible). Then let them teach the tune and verse to another class. Part of the teaching process can include explaining the meaning of the verse and describing how it applies to the children’s lives. Challenge your students to memorize as many Bible verses as they can within a certain time frame. As each child says his verse to you, add a link to a paper chain with the student’s name and the memory verse reference written on it. This is something everyone can contribute to, even if it is just one link. At the end of the time frame, present the chain to the church and request that it be displayed in a prominent place. If it is Christmas, you might decorate the church tree or fellowship hall with it. A good leader is always thoroughly prepared. A concert pianist wouldn’t dream of going into a recital without hours and hours of practice and preparation. Why should a teacher or leader feel that his performance demands less practice? Remember — in teaching from God’s Word, we’re dealing with the souls of children! How this should challenge us to be more diligent in our preparation of every Bible club activity, including Bible memorization! Don’t minimize the importance of your calling as a leader. Ask God’s wisdom and direction as you prepare for the task of teaching and training children to get to know and love God’s Word. For a PDF version of this post, download the file, Bible Verse Memorization Tips and copy it for your coworkers and parents. I've been making these for a few years but my kids like the more recent ones. Let me know if there are any verses you'd like me to make for you and your church. Thanks and God bless.